Mangoes have disappeared for now and the pawpaws available are not nice. So I was wondering what fruit to add to the humble banana to make a nice yummy fruit salad. Nothing much was available besides apples and grapes. 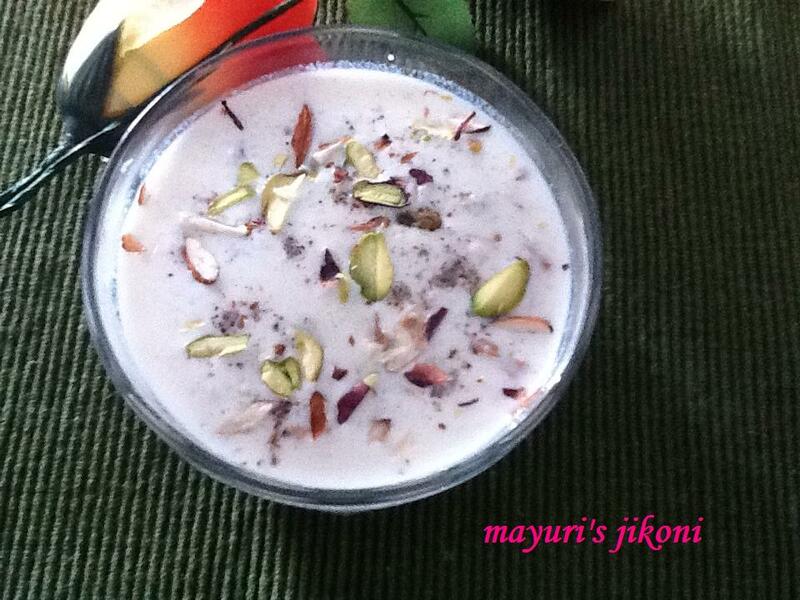 I had no choice but to make nice hot kheer for hubby dear as he too fasted for Janamashtami yesterday. We both like sabudana kheer nice and cold and I had forgotten to make it the previous day. Very early in the morning I remembered having samo kheer as prasadam on Ekadashi day from the Juhu ISKCON temple. Hot kheer with just a touch of cardamom and lots of cashew nuts. So I made samo or moriyo kheer and its the simplest kheer I have ever prepared. Quick, easy and delicious. A bit of the kheer was left over and in the evening I added fresh fruits to it to make it into a filling meal. Yummy…. can’t wait for Ekadashi which is just round the corner to make the kheer again with loads of fresh fruit. Wash the samo just like rice and keep it on the side till required. Put the milk in a non stick pan over medium heat. When it begins to boil, add the samo. Keep stirring occasionally and let the mixture simmer for 10 minutes or till the samo is cooked. Add the chopped nuts, raisins, sugar and cardamom powder. Mix well and serve. Instead of sugar you can use any artificial sweetener. Add more nuts and dry fruits if you like. Add chopped fresh fruits to the cold kheer. Puree dates and dry figs and add to the kheer. Use low fat milk if you like. super creamy and yummy!!! Thanks for linking it to my event!! Looking for more yummy recipes! !